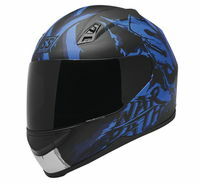 This helmet features an Advanced Thermo-Poly Alloy™ (A.T.P.A.) shell, a removable, washable, moisture-wicking liner, an Air Strike™ direct course ventilation system, a Lock ‘n Load™ shield replacement system, and an All Clear!™ sight system: optically correct, anti-scratch, and UV-resistant faceshield. This sizing chart is based on information provided to us by Speed and Strength and is subject to change without notice, although we will do our very best to keep it up to date. We recommend that you measure your head by wrapping a cloth tape measure around your head about 1 inch or 2.5 cm above your eyebrows, which should be the largest portion of your head. Choose the helmet that is closest to your measured head size. If you fall between two sizes, choose the smaller of the two. You want a helmet to fit snug without being uncomfortable.